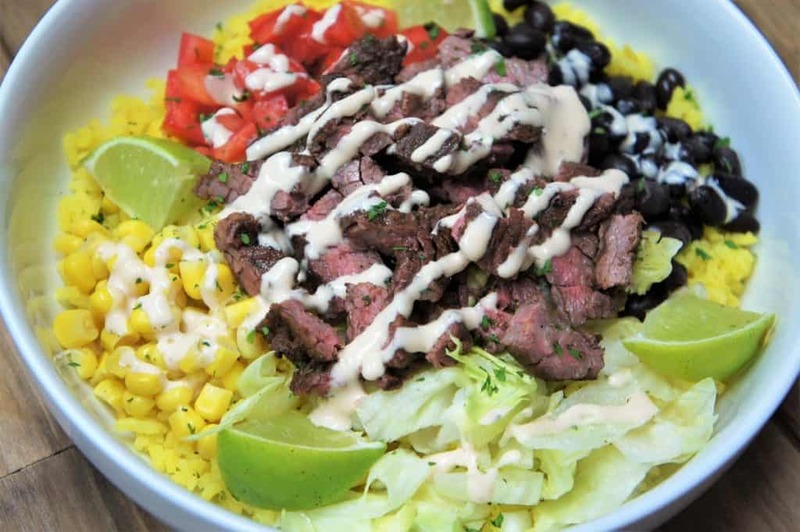 This Southwestern steak bowl is a delicious way to get out of the boring dinner routine. 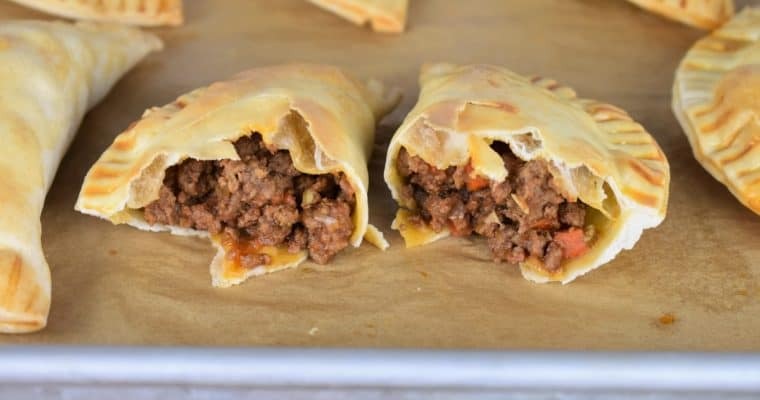 It’s easy to make and loaded with delicious ingredients. This bowl starts with a bed of yellow rice, that gets its beautiful color from good-for-you turmeric instead of artificial coloring. The rice is topped with lettuce, tomatoes, corn and black beans. Then we add perfectly seasoned grilled steak, and finish the whole thing off with an easy-to-make chipotle ranch dressing. If you’re in the mood for more Southwestern inspired meals, try this Southwestern pasta, that the family is sure to love. This Southwestern steak soup, that’s hearty and delicious, or this Southwestern chicken salad, that will get you out of the boring salad routine. Enjoy! This bowl is easy to make, but it does have several components that need to be prepared separately. I like to prepare the dressing first so it can set while it chills in the refrigerator. Then start with the rice, it will take the longest. 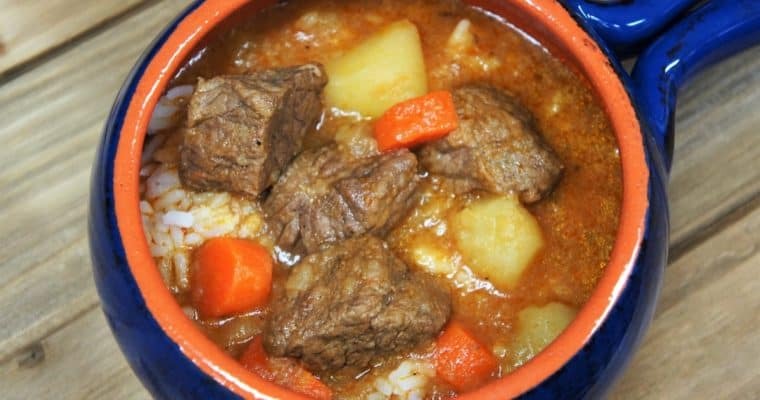 Plus, the rice can stay warm on low heat until ready to serve. While the rice is cooking, prepare the toppings, season the steaks and grill. They shouldn’t take very long to cook, but it depends on how thick they are and how rare you like them. Then build the Southwestern steak bowls and dinner is done! Add ranch dressing (enough for 4 servings) to a bowl or dispenser. Add the chipotle hot sauce to taste. Stir well to combine. I like to start off with just a little bit of the hot sauce, then I taste and adjust until it’s just right. Refrigerate the chipotle ranch dressing until ready to serve. Bring the water to a boil in a medium saucepan. Add the chicken base, minced dehydrated onion and turmeric. Stir well until the bouillon is dissolved and the ingredients are combined. Add the rice to the saucepan, lower the heat to medium and stir well. Continue simmering the rice, uncovered, until most of the water has cooked out. The rice should be visible on the surface, about 10 minutes. Give the rice another quick stir, lower the heat to low and cover. Cook the yellow rice for about 25 minutes, or until done. Fluff the rice with a fork, keep warm until ready to serve. Add the salt, chili powder, garlic powder, onion powder and cumin to a small bowl. Stir well to combine. Sprinkle the prepared seasoning mix on both sides of the steak. Cook the steaks on a preheated grill over moderately-high heat for a few minutes on each side until the desired doneness is reached. Cooking time will depend on the thickness of the steak and the desired temperature. Place the steaks on a cutting board or pan and let them rest for a few minutes prior to slicing to allow the juices to redistribute. If you slice the steaks right away, all the juices will run out. Remember to slice the steaks against the grain. 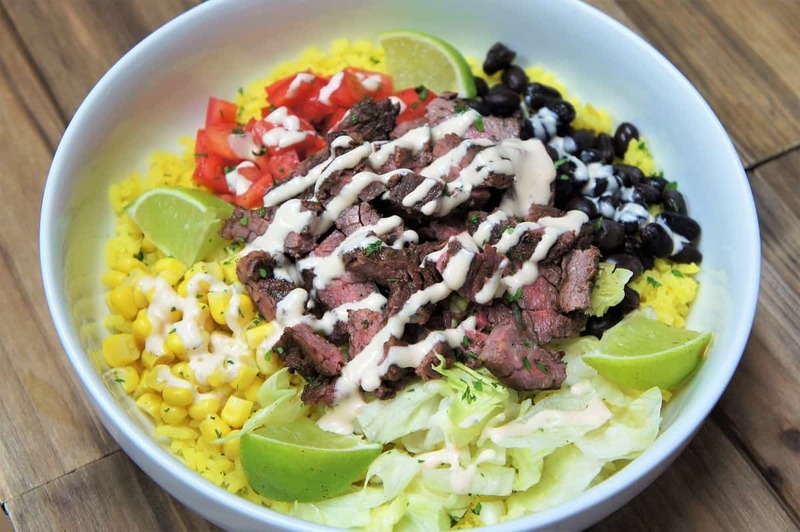 While the steak rests, build the bowls. Add a generous bed of rice to individual bowls or plates. Divide the remaining ingredients into four portions. Top each plate with the lettuce, tomatoes, corn and black beans. Sprinkle with the chopped cilantro. Divide the sliced steak into four servings, and add to each salad. 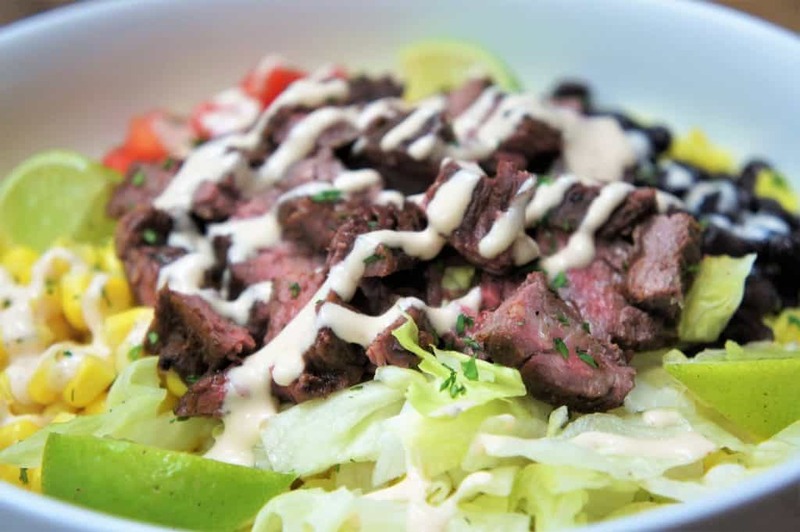 Serve the southwestern steak bowls with the chipotle ranch dressing and a couple of lime wedges. Enjoy! 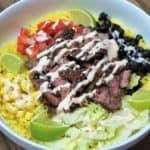 This Southwestern Steak Bowl starts with a bed of yellow rice, that gets its beautiful color from good-for-you turmeric instead of artificial coloring. The rice is topped with lettuce, tomatoes, corn and black beans. Then we add perfectly seasoned grilled steak, and finish the whole thing off with an easy-to-make chipotle ranch dressing. Add ranch dressing (enough for 4 servings) to a bowl or dispenser. Add the chipotle hot sauce to taste. Stir well to combine. Refrigerate the chipotle ranch dressing until ready to serve. Bring the water to a boil in a medium saucepan. Add the chicken base, minced dehydrated onion and turmeric. Stir well until the bouillon is dissolved and the ingredients are combined. Add the rice to the saucepan, lower the heat to medium and stir well. Continue simmering the rice, uncovered, until most of the water has cooked out. The rice should be visible on the surface, about 10-12 minutes. Give the rice another quick stir, lower the heat to low and cover. Cook the yellow rice for about 25 minutes, or until done. Sprinkle the prepared seasoning mix on both sides of the steak. Cook the steaks on a preheated grill over moderately-high heat for a few minutes on each side until the desired doneness is reached. Cooking time will depend on the thickness of the steak and the desired temperature. Place the steaks on a cutting board or pan and let them rest for a few minutes prior to slicing to allow the juices to redistribute. Add a generous bed of rice to individual bowls or plates. Divide the remaining ingredients into four portions. Top each plate with the lettuce, tomatoes, corn and black beans. Sprinkle with the chopped cilantro. Divide the sliced steak into four servings, and add to each salad. 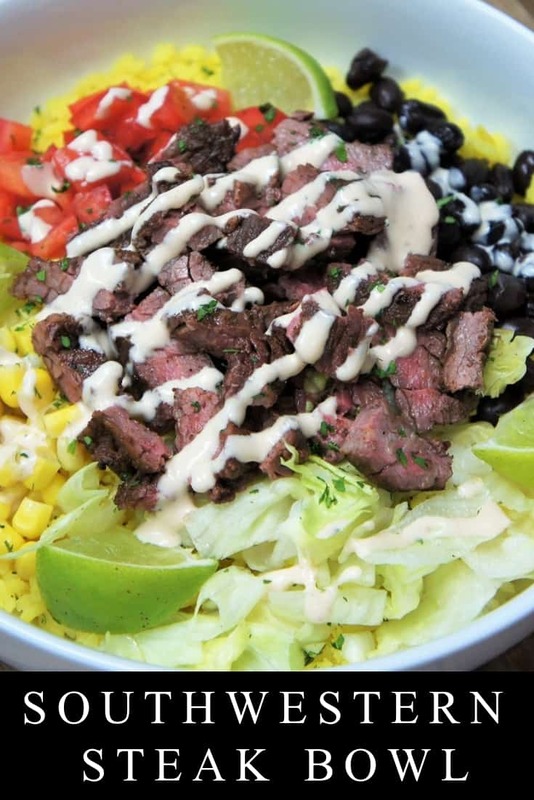 Serve the southwestern steak bowls with the chipotle ranch dressing and a couple of lime wedges.